Hockley Valley may not seem like an obvious location to establish a winery, and that’s what makes it an ideal spot for Mario Adamo. Visionary, risk-taker and pioneer. True to his vision, Adamo Estate Winery has already produced wine for 4 successful seasons. March 2015 saw the ¬first onsite bottling of the 2014 vintages. In the spring of 2015, the team were equally thrilled and proud to be crushing the Chardonnay, Riesling and Vidal on the very fi¬elds Mario had planted by hand. Though Adamo Estate Winery was a dream born out of Mario’s historical fondness, an innate curiosity and a desire to succeed, his vision is innovative and focused on family tradition, something the Adamo family has already proven to be a successful formula. Adamo Estate Winery is a small-batch boutique winery with 23,000 vines, focusing on organic and biodynamic practices. Starting with the best fruit from the estate, and from some of the top growers in Ontario, their fruit speaks for itself and their terroir-driven wines. Located in the beautiful rolling hills of Hockley Valley, just 1 hour north of the GTA, the winery offers a beautiful retail space and tasting bar, as well unique event and meeting spaces overlooking the vines, tanks or the cellar. We focus on cool climate Chardonnay and Pinot Noir, making those our principal varietals, followed by: Riesling, Gamay Noir, Cabernet Franc and Vidal. Other varietals we carry include: Chardonnay Musqué, Marechal Foch, Merlot and l’Acadie Blanc. Take in the scenic beauty of the region, tour the winery and taste the fruits of their labour! Visit Adamo Estate Winery’s website at adamoestate.com. Ever wondered who oversees the day-to-day at the vineyard? Introducing… Shauna White, our Vineyard and Winery Manager. Shauna grew up in Kelowna, BC, spending her days in her family’s vineyard (her aunt is renowned organic winemaker Anne Sperling) so you might say she’s got wine in her blood! Upon deciding to follow her passion, Shauna began the formal part of her education at Niagara College, becoming a certified Wine and Viticultural Technician. 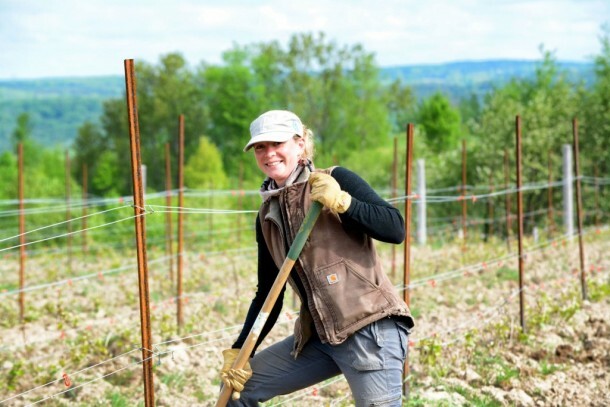 While spending her practicum at Domaine Laroche in Chablis, France, she fell in love with Chardonnay – and with travelling! Shauna continued to broaden her horizons by spending time at Ponzi Vineyards in the Willamette Valley (Oregon), at Brokenwood Wines in the Hunter Valley (Australia), at Le Clos Jordanne (Niagara, Ontario), Mt. Difficulty Wines (Central Otago, New Zealand), Ravine Vineyard (Ontario) and at Road 13 Vineyards (Oliver, BC) settling at Adamo Estate Winery in 2014. Shauna puts her passion and experience to great use with us, working with the Adamo family to grow and harvest fruit from our region, and to make wines that have heart and history. Adamo Estate Winery is a very cool place! We are located in the Hills of Headwaters in Mono, Ontario. Our latitude/longitude is 44°03′00″N80°04′28″W and our altitude 435 metres. Our vineyard is planted on beautiful rolling hills along the northern part of the Niagara Escarpment. We are located 60kms north-west of Lake Ontario and a km south of Hockley Valley Resort. Lake Ontario does not directly affect our micro climate which allows us to have more extreme temperature variations in the winter and summer. Due to the location, which is generally an equal distance from 3 large bodies of water, a consistent breeze is often travelling through our vineyard. We bury our vines for the winter, similar to Prince Edward County, which helps us to prevent winter damage or death to our young vines. Chardonnay is definitely a focus for us and since our first Chardonnay vines were planted in 2012 we have seen great success! We have expended our Chardonnay clone and rootstock selection as we have expanded our vineyard; now totalling 5 acres of Chardonnay on our estate. Adamo Estate Winery believes that great vineyard sites and great growers are the key to having a sense of place and terroir in great wines. We are working with 2 exceptional vineyards in Niagara. The Willms Vineyard in Niagara-on-the Lake – Four Mile Creek appellation boasts older vines planted in stoney, sandy, soil with deep roots. The wines showcase true Niagara-on-the Lake characters from the weight and elegance of the wine, to the fruit driven aromas and support of oak flavours. The Lore Vineyard which is also located in the Four Mile Creek appellation within NOTL, is a mature planting with closer proximity to the Niagara River and the soil in the area has a higher percentage of loam. This 20 year old planting has a unique trellis system of Scott-Henry, with plantings of the Chardonnay Musqué clones throughout the block. This vineyard is managed by Huebel Grapes Estates, which specializes in premium viticulture. Adamo Estate Winery celebrates all great growing regions for Chardonnay in Ontario, and why we choose to work with many vineyards that have very different expressions of the awesome grape, Chardonnay.